The Women’s Federation for World Peace, International (WFWPI) was established in 1992 by Dr. Hak Ja Han Moon in an effort to address the confusion of a world seeing a breakdown in family ethics, as well as the escalation of racial and religious struggles. Dr. Moon and her husband, the Rev. Dr. Sun Myung Moon, are a remarkable couple who have worked together, for almost fifty years, to pioneer a way for peace.The Women’s Federation for World Peace, International (WFWPI) was established in 1992 by Dr. Hak Ja Han Moon in an effort to address the confusion of a world seeing a breakdown in family ethics, as well as the escalation of racial and religious struggles. Dr. Moon and her husband, the Rev. Dr. Sun Myung Moon, are a remarkable couple who have worked together, for almost fifty years, to pioneer a way for peace. Connecting Girls Inspiring Futures . This is a very interesting theme. For me I understand that to mean two things. First, how can we inspire girls to connect to the goals of the international Women s Day, so that they can carry the banner into the future? Then how can we help the next generation of girls to achieve fulfilling, meaningful and happy lives so that they can look forward to inspiring futures? International Women s Day is the story of ordinary women as the makers of history, rooted in the centuries old struggle of women to participate in society on an equal footing with men. At the turn of the last century it was concerned with achieving universal suffrage for women. Up until recently I was actually the Executive Director of Muslim Women’s Network UK but left that post and started my new role as the Global Campaign strategist for Oxfam. However, after working so hard to build up the network, I wanted to continue supporting it so I am a board member. MWNUKis the only national Muslim women’s organization in Britain. Members are diverse in terms of age, profession, ethnicity and are across the religious spectrum. 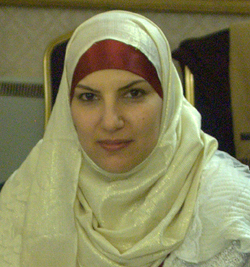 Members are a mixture of groups or individuals who are able to reach other Muslim women. Although the majority of members are Muslim women, we also have female members who are not but either work with Muslim women or are interested in Muslim women’s issues. In fact we tried to reflect this diversity by co-opting a board members recently who was not Muslim. In the last four years I turned an informal group of about 30 Muslim women to a membership of about 400 who between then have a reach of more than 40 000 Muslim women. What do we do? We do not deliver a service but rather an advocacy group involved in raising awareness of issues, lobbying government and providing information to our members. 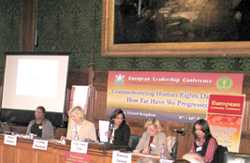 Mitty Tohma, President, Women’s Federation for World Peace (WFWP) - UK, chairing the session. 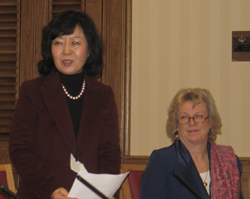 introduced Carolyn Handschin, President, WFWP International - Europe, who gave the first presentation on the activities of the WFWP. She first gave a brief overview of the movement for women’s rights from the time of Mary Wollstonecraft. In passing she mentioned Queen Anne who had unsuccessfully campaigned for a women’s college. She moved via domestic science to the conferences of the UN Commission on the Status of Women that emphasized the family as the cornerstone and model for human relationships. She quoted Kofi Annan who said that human rights create the space for family life and is the standard for ethical relations among people. This suggests that the grass roots and global campaigns for human rights needed to be connected. Lord King, Baroness Verma and Lady Hodgson, members of the panel, ladies and gentlemen, sisters; it is a great honour for me to have the opportunity to share a few words with you at this special gathering here this evening. I think it is very significant that on the occasion of the 100th anniversary of the establishment of International Women’s Day we can hold this meeting at the seat of political power in the United Kingdom. When International Women’s Day was established in 1911, women in this country did not have the right to vote. Since then we have seen the influence of women growing over the years, culminating in the election of Baroness Margaret Thatcher as Prime Minister in 1979. In a few years we will also celebrate the 60th anniversary of the coronation of Queen Elizabeth II whose reign represents a beacon of stability in a rapidly changing world. These two great and historical women have been an example and an inspiration for people throughout the world. Rita Payne - Women and Success – Is Hard Work Enough?